Prior to 1877, Fremont and Custer Counties were one and the same, and yet today, aside from the Fremont Custer Historical Society, we share very little. Most people who live in Custer County very rarely “go below” to Fremont. They take the odd trip down to Canon City, but no sooner have they picked up their pavers from Home Depot, eaten at the Owl, and bought a nearly new shirt at Goodwill, then they turn-tail and head back up the mountain. This unattributed sculpture exemplifies the contemporary fabric artists who work suspended in space. Currently FCA is hosting a knock-out show mounted by the Westcliffe Contemporary Quilters and Fiber Artists. Not that I don’t appreciate traditional quilting, but I love the inventiveness… the whimsy… the thinking outside the box… of contemporary fabric artists who have not only the sewing skills but also the quirkiness to go where no man has gone before. The proof, of course is in the pudding. I’m including a few photos to establish proof. 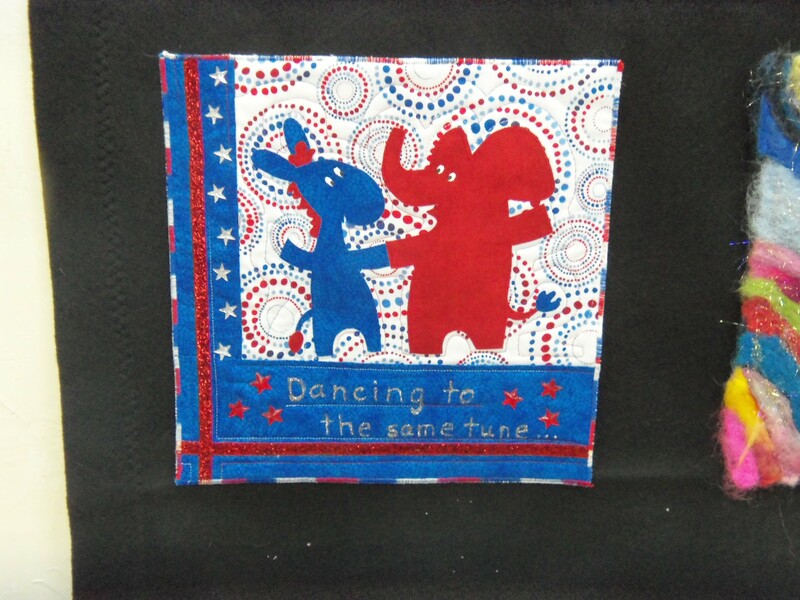 One feature of the exhibition is 12″ x 12″ squares sewn to illustrate twelve, monthly themes. Twelve, squares are arranged as window panes, three squares over four. How intriguing to see twelve interpretations on one theme. If you are ever disheartened thinking that big box stores and television have homogenized our brains, you can see this show and take heart. Individual creativity is alive and well. Rhonda Denney exhibited numerous pieces that I liked – so many that it was difficult to choose my favorite. Her Zebra caught my eye, as did her environmental entry: hands cupping a heap of earth. So many choices… so little time. In the end, I decided on Denny’s entry for the theme of “Sweets.” Aside from the needlework, she layered applique and paint using colored pencils, pastels, and fabric paint. I can taste the watermelon. The juice is dripping off my chin. Given my interest in politics and my need to find lightness, humor or intelligence anywhere on the political landscape, I laughed aloud when I saw Deb Martin‘s submission. Her square was wonderful in itself, but as one of twelve interpretations under the banner of “Fantasy,” my heart leapt up at the meld of technique, color and cartoon humor. Indeed, quite the fantasy. Betty Johanson. Her lime green Tree frog (with bulging deer-in-the-headlight-eyes) hangs on to earth for dear life with his sticky orange toes… as in real life, the Tree frogs cling on despite a loss of habitat and climate change. Johanson is a fabric artist, layering technique on technique, but she ups the ante with her playful interpretation and political message. 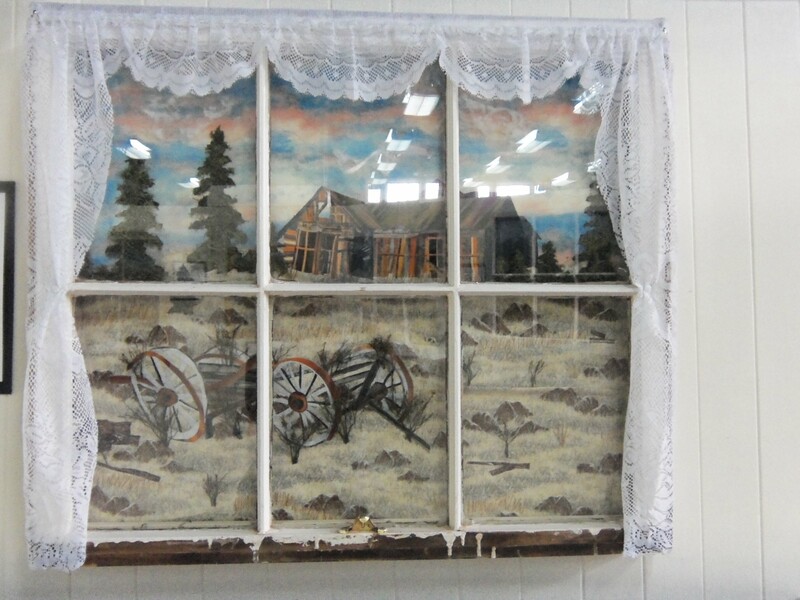 In addition to the twelve, 12″ squares on one theme, the contemporary quilters exhibited works (I’m not sure… titled something like “Windows on Westcliffe”) framed by discarded window frames. In most cases, the fabric artists wrote commentary and included photos of the Custer County scene that had captured their fancy. Again, I loved each and every one – each so individual and creative. Choosing one window to feature was difficult. 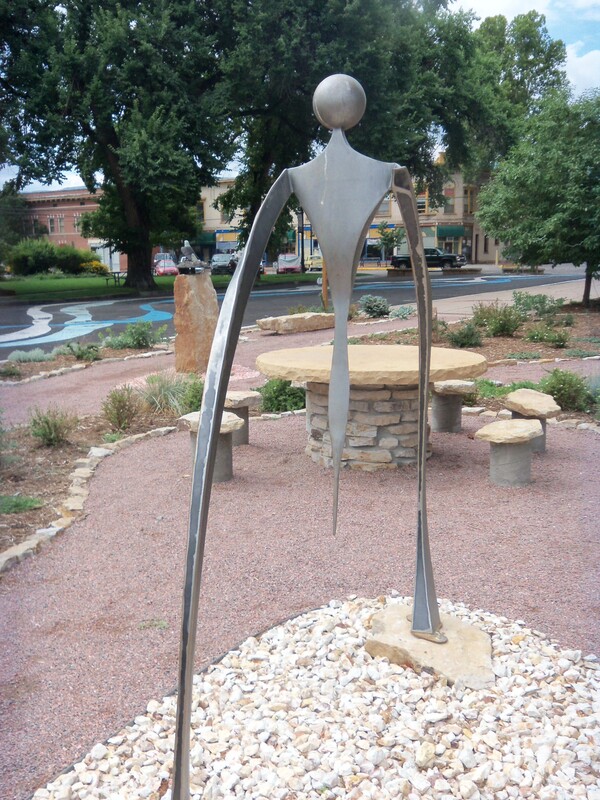 Kay Loudenberry‘s work is a good example. The distressed window framed by the curtain perfectly frames the scene and sets the period of the derelict home and the broken wagon. Julie Stamper‘s window caught my attention because instead of looking out of a window, we see a child (no doubt standing on tiptoes) looking through the window and into a sweet shop. 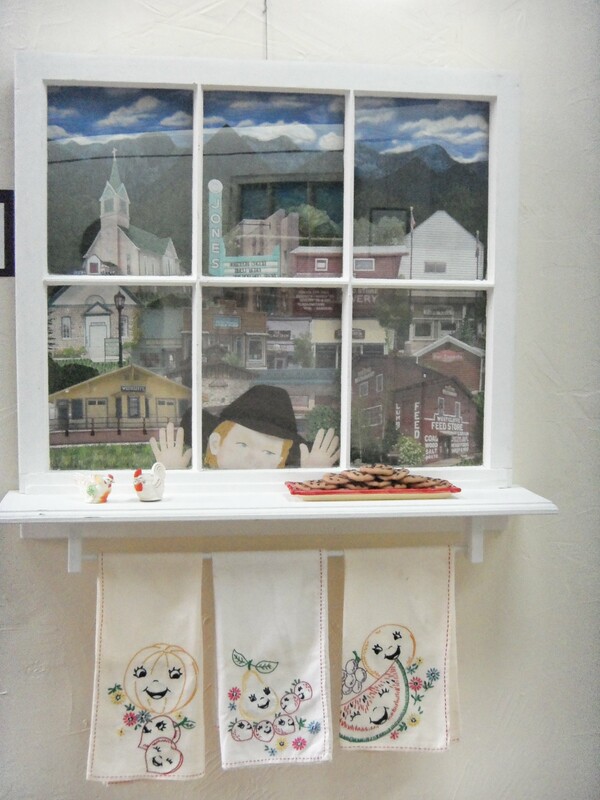 Looking out… looking in… all in the same scene with familiar Westcliffe buildings (the Lutheran church, The Feed Store, the iconic Jones Theater) on the outside and the cookies and the tea towels on the inside. I was dazzled by the multiplicity. What a trick! Individualism is alive and well. We are not all cut from the same piece of cloth. What a good feeling. The show runs through August 30th. Honor our local artists and treat yourself. It is a mind-blowing exhibit. 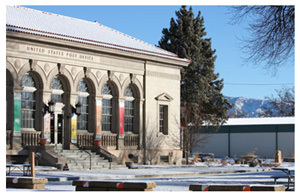 The gallery is open Tuesday through Saturday 10 – 4. Mondays the gallery is closed. During the summer, FCA is open noon to 4. 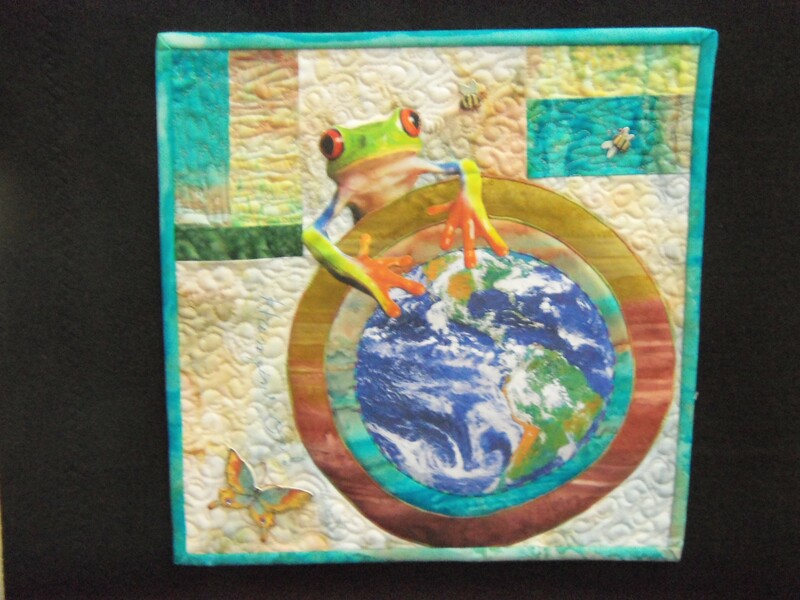 This entry was posted in Uncategorized and tagged Betty Johanson, Canon City, Deb Martin, Fremont Center for the Arts, Fremont County, Julie Stamper, Kay Loudenberry, Rhonda Denny, Westcliffe Contemporary Quilters and Fiber Artists. Bookmark the permalink. Most of us would never have known about the quilt exhibit without your post. I HAVE to see these quilts and works of art for myself. Thanks for alerting us to this. In my haste to post my blog before going to Zumba, I didn’t check the gallery hours. I have corrected my mistake. Mondays the gallery is closed. During the summer, the Gallery is open noon to four on Sundays; otherwise, the gallery is open Tuesday through Saturday from 10 – 4. You are going to love this show – I can’t do the quilters justice in one short blog. Thank you for writing such a wonderful report about our show! it is much appreciated!!! Thank you for reading! I really enjoyed the show as a whole and plan to return with friends. Loved your entry, “A Day [with Sarah Shields] at San Isabel Ranch. Did you send Sarah a photo? I took one if you want to send it on to her. Thanks for your very favorable comments on our show. We have worked hard for well over a year and we accomplished what we set out to do. What fun! Dear Jane, No need to thank me – the pleasure was all mine. My only regret was that I didn’t have time to feature each and every artist. In many cases, the light from FCA’s wonderful windows, distorted the picture that I took. A real pity. I noticed, however, that FCA has hung a shade or two, and they have a number of shades in the women’s restroom. Picture-wise, that will be a big improvement. I loved your birdhouses made under the umbrella of “Home.” Also your “Sangre Autumn.” Looking forward to joining your group this winter – you’ll have a lot to teach me. Hi Doris! 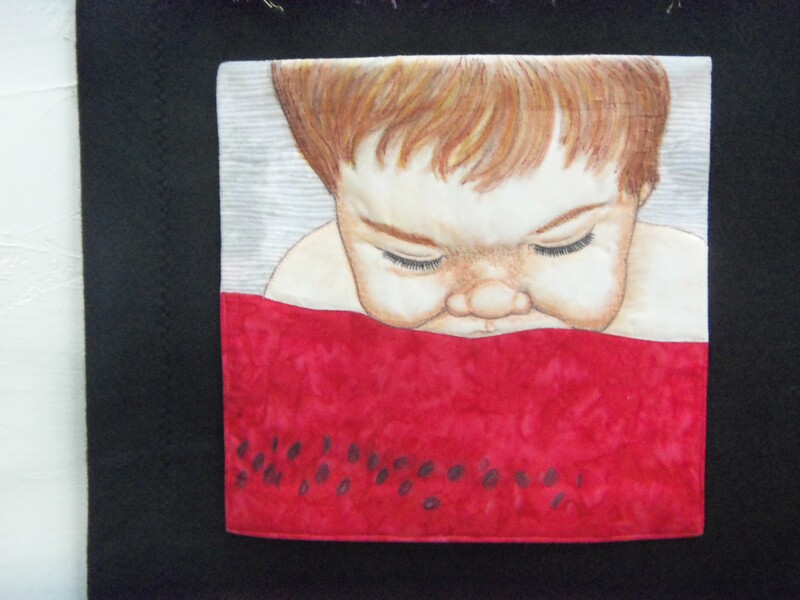 So glad you like my art quilts! I sure have fun creating them! I do have a request for a change… my last name is spelled Denney. Could you please change that so people can find me? Thanks so much! It is such fun being a part of the WCQFA group. They do keep us busy, but that is what is needed to get those creative juices going! I am so very glad to have been invited to join them! Take care!